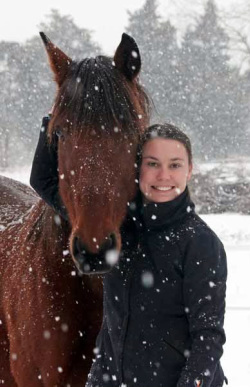 I am a fully insured, professional horse trainer and instructor based out of Skillman, NJ. I have 13 years of experience on various ends of the horse industry and a degree in communications, which has fine-tuned my teaching skills. I specialize in starting young horses, working with 'remedial horses', re-training standardbred racehorses, teaching riders with confidence issues and beginners, as well as trail and endurance riding. I spent six years working at a prestigious harness racing training center in north Jersey and three years in the breeding industry before taking a barn manager and trainer position with a large equine non-profit . There I started, trained, and showed horses of all ages and abilities. Some of the horses I trained have gone on to compete successfully in dressage, jumpers, eventing, barrel racing, Working Equitation, and endurance. Others have gone on to work in law enforcement and therapeutic programs. Currently, I exercise ride racing thoroughbreds at a training center in Hunterdon County. My varied background has taught me the importance of cross training and a well-rounded horse. My training program focuses on building a quiet, reliable, and obedient horse. Desensitization and suppleness are key and no short cuts are taken. I use a pressure/release-based training method that combines natural horsemanship and classical dressage principles.The goal is to build lasting results while teaching the rider to be confident and independent. Riders are taught skill sets that can be used on all levels of horses outside of the program. I want riders to be able to handle their horses safely and productively even when I'm not there to give instruction. The rider's concerns are first and foremost, and each student's program is personalized based on individual needs. I competed my own horse in endurance, completing 50 mile rides up and down the East Coast. I also catch ride extensively. My endurance riding resume includes completions in distances up to and including 100 miles as well as Top Ten finishes across three AERC regions and counting. I have also competed in other disciplines including hunters, equitation, and dressage. I believe that dressage should be the base of all good training and that all horses should be trained to move off subtle cues from their riders. Suppleness, lateral work, and the dressage training pyramid are incorporated in my training program across the board. Lessons are on a first-come, first-served basis so please call or email to secure your appointment.